Why use the Technology Coaching Ink Tuning procedure? 1. 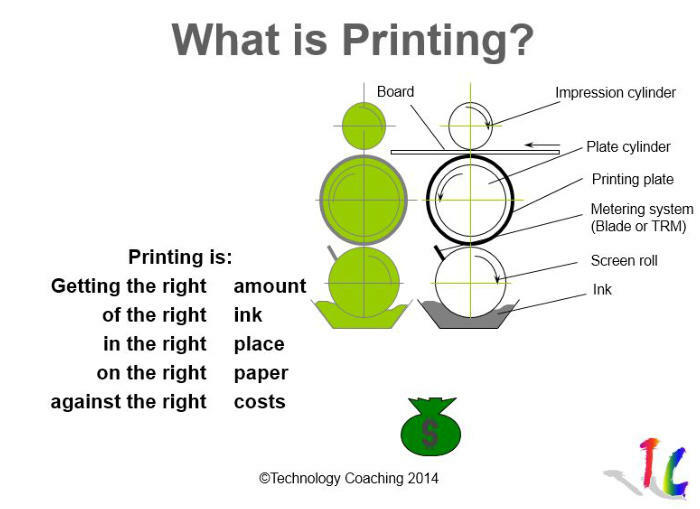 You want to get the best print result? All printers want to get the best print result and at the same time maximum productivity. Current practice shows this is achieved by trail and error taking a long time and often never finding the optimum. Using the by Technology Coaching developed Ink Tuning procedure makes this job easy, fast and based on facts and figures. By conducting a series of tests you know how to set your ink right and what are the specifications for your screen roll and print plate. 2. Do you want to change screen rolls when changing substrate? Printing industry claims that you need different screen rolls when printing on different substrates (coated and uncoated liner). This might be needed to get the maximum out of the process. But changing screen rolls has a big impact on your machine uptime and productivity. The Ink Tuning procedure allows to find the best ink set-up maximizing print Quality and Productivity. The procedure will reveal that, in some cases, it is possible to print on coated liner using screen rolls intended for printing on uncoated liner. It is not always needed to change screen rolls in order to get the best result. 3. You want to optimize the use of your dryers? Installing dryers on your printing equipment is easy but how do you use them and how do you set your ink. The Ink Tuning procedure allows optimising the ink in function of screen roll, substrate, production speed and dryer settings. 4. Maximizing gloss level? You have installed dryers and are printing lacquer to get gloss on your surface. How do you know you print the right ink film thickness in order to get the maximum gloss level. Printing a thicker lacquer film does not automatically result in higher gloss. There is an optimum lacquer film! Printing a too thick lacquer film results in a reduced gloss level. The Ink Tuning procedure reveals the optimum settings. • Delivering a consistent printed product to your customer. • Optimum ink settings in function of screen roll and substrate used. • Optimized repro specifications for print plate. • Minimized waste during set-up (First sheet right principle). • Maximized productivity (Machine speed and uptime). Contact Technology Coaching if you want more information or a quotation.